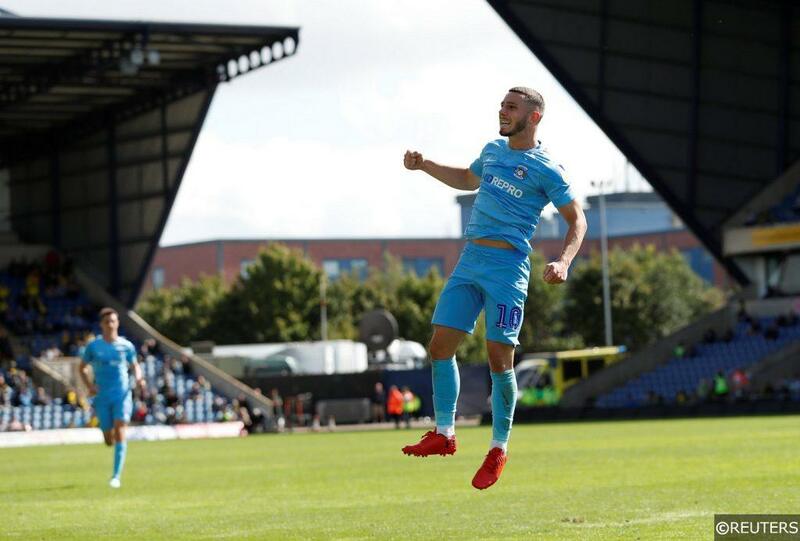 The 2018/19 League One campaign has so far been an excellent one as far as strikers are concerned. Fans of England’s third tier have been treated to an abundance of goals by a handful of centre-forwards, who quite frankly, could easily be plying their trade at a higher level. There are currently 11 players in League One with at least 12 league goals to their name, so there’s no shortage of goal-scorers for punters to get stuck into. Punters who like to get their cash down in the ‘Anytime Scorer’ market will have few problems finding a likely goal-scorer ahead of any given match-day. Luton hit-man James Collins, who has bagged himself 18 goals this season, currently tops the charts, while Doncaster’s go-to goal-getter John Marquis sits in second with 16 league goals. There’s then a cluster of players breathing down the neck of the top two, as Rochdale’s Ian Henderson, Barnsley’s Kieffer Moore and Gillingham’s Tom Eaves have all notched 15 league goals during the current campaign. By following such players, punters are unlikely to go far wrong in terms of likely scorers, though because the above have been so prolific this season, bookmakers are now running scared and thus backing the likes of Collins and Marquis to find the net going forward is unlikely to represent much value. Below we highlight a few who’ve perhaps slipped under the radar and who may just represent some value in the ‘Anytime’ Scorer’ market over the coming weeks. While many of the League’s main attacking players have thrived in front of goal, there are a couple who’re yet to come to the boil; players who’ve got into the right areas without getting the rub of the green or players who’ve had chances but haven’t quite got their eye in. By following such players over the coming weeks punters may just be able to profit. First up, we’ve got Bradford’s 30-year-old forward Eoin Doyle. No stranger to bagging goals at this level, Doyle, who notched 15 times in 30 appearances for Oldham last season, has so far scored eight goals in League One this season. In the goal-scoring charts, Doyle currently ranks 22nd, though in the individual expected goals chart, Bradford’s joint top-scorer ranks as League One’s seventh most dangerous player. This tells us that the 30-year-old is getting himself into good goal-scoring positions and if such expected goals figures are maintained, then it won’t be long before the Bantam moves up the scoring charts. Like Doyle, Conor Chaplin is another striker who has scored just a modest amount of goals this season, but he also ranks well in terms of expected goals. The Coventry striker currently sits 10th in the individual expected goals chart, even though he’s played less games than each of the nine players in front of him. An average of 0.48 expected goals per game suggests that Chaplin is a player who is forging scoring opportunities with regularity and if he can continue to maintain such an average then we should be seeing his name registered on the score-sheet plenty during the next few months. It may be difficult to veer away from the highest scoring players when it comes to choosing an ‘Anytime Scorer’, though if we look at the prices ahead of this weekend, it’s easy to feel differently. For example, the likes of Marquis and Henderson can be backed at around 11/10 and 6/5, while both Doyle and Chaplin are generally 21/10 shots. Given that there’s little between the four in terms of expected goals, backing the two at much juicier prices makes plenty of sense. Check out all of our latest League One match previews, predictions and betting tips here. Categories: Blog and Football. Tags: League One. Team Tag: Bradford City and Coventry. League: England League 1. Sports: Football.